In this article, the first of the articles in the series of understanding dog crates, we are going to discuss why every dog should have a crate. It’s true this topic has sparkled fierce crossfires across different dog owners across the internet. The big question begging answers being, whether to crate or not. Regardless, of the school of thought, crating is essential as we will discuss in this article. But before I get bashed with everything the world has against crates, while reading and internalizing this article, I want you to view it in the perspective of a dog, not the way we think about crates. As such, I would rather we dwell in the beauty rather than in the muddying and annoying topic of the cons. So, shall we get into the business? Your Dog Should Have A Sense Of Ownership And Belonging. Your Dog Should Own Its Den Within Your Household. a crate make training your dog a piece of Pie. Using A Dog Crates Will Help A Destructive And A High Anxiety Dog Triumph The Shortcomings. Dog Crates Makes It Easy And Safe To Travel And Camp With A Dog. Why We Steered Away From The Cons In This Discussion. Our world operates in certain principles. In terms of wealth and ownership, some people own more than others. Some become more popular as a result. Some are satisfied at the level they are at the moment. Nevertheless, there's one universal fact that cuts across the board. No matter how little or much we may have, we all have a certain level of esteem with the value we attach to our belongings. It’s through this ownership that we feel secure and get status within the society. As such, even our loyal furry friends experience the same feelings. They too have a magnetic affection with things they own. It’s through these items that they become happier and better companions. To add another illustration, to prevent your dog from playing with your shoes or socks or anything else unacceptable, you get its toys. Right? Similarly, to give it something it can associate with its ancestral home, you must get it a crate - a place it can rest and sleep. That goes without saying, with a crate, there are so many advantages. Take for instance, if you want to keep your dog off your sofas or off your bedroom or away from certain rooms, the best action is to make sure it has a place that it has a sense of ownership and belonging. Remember, the goal is to create a safe haven, not a prison for your pooch. With that, let’s head to the next point for further clarification. To make this point clear, let’s me take you back to several centuries ago. To be precise, around 17,000 to 14,000 years ago. It was way before people could trust sheep or cats to live near their camps, leave alone their households. In those, not well-known days, history narrates to us that dogs are ancestors of canines like wolves, jackals, coyotes, and other dog-like canines. So, during those golden ages, these animals would live in caves. Due to human activities and free food near human settlement, they will come to scavenge secretly. Those canines that were friendlier to people become modern dogs after a long process of building solid friendship, trust, and even breeding to form superior breeds. However, the bottom line is the fact that dogs used to live in dens. Now, fast forward to date. There're no more dens. Through human pampering, dogs have lost their doggiliness. They are expected to behave more like humans. Today, they live by us in our apartments. They sit in our couches. They even sleep in our beds. But buried deep within, regardless of what we want them to believe or behave, they are still their ancestors. So, to bring your dog closer to its native lifestyle (that of living in a den), owning a dog crate is a MUST. As such, it should be one of the defacto items you must own. But how should a crate come in handy? Let’s roll to the next point to answer this burning question. We all have a different lifestyle and different way of treating those that are close to us. However, there’re some traits that are bedrock to all relationships. It’s true, whether it’s your wife or husband, children, or comrades, the feeling that someone respects your boundaries and gives you a sense of privacy creates harmony in our lifestyle. These two creates a peaceful and frictionless coexistence between family, friends, neighbors, nation, continent, and entire world. Similarly, these simple principles should guide us when relating to our pets. It’s, therefore, upon us to take full responsibility for our dogs, to trains and instill traits that guide them to respect our boundaries and privacy. Fortunately, to make your dog respect your boundaries and privacy is as easy as creating an environment that fosters these positive behaviors. Take for instance, when your dog is tired or lazing in the house, it shouldn't be lazing anywhere. It should be somewhere quiet. Somewhere so familiar that it feels like it owns it. But the only way to achieve this is through a dog crate - its little den. However, to make sure that the dog respects your boundaries, it must have some training. Right? The next point explains why a dog crate will make your dog even better when receiving training. Well, it’s arguable that crate training is cruel and inhumane. But remember the concept of a den. Today dogs, like their ancestors, love their territories. A crate will surely give it a dominion to rule. That’s why, when it comes to discipline, a crate will speed up your training in folds. However, there are dogs like pitbulls that are known for stubbornness. Sure, they are intelligent and sometimes don’t take instructions easily. But still, if there is an item I highly recommend, is a crate. It should be your close ally from the first time you adopt your dog. Below Are Two Tips To Guide You When adopting a Dog. If you plan to adopt a puppy regardless of the breed, start making it used to crate from the first time you make it a family member. If it’s an elderly dog from the animal shelter, introduce it to the environment the first time you take it from the shelter. Then again when you reach home (right after you take it off the van to walk it in your house). Later, immediately after you introduce it to your apartment. These simple steps say, "this is your territory buddy you better fall in love with it." If you are wondering whether there is a guide to help you introduce your dog to its crate, don’t worry. I’ve got you covered. Here is a step by steps process to coax your dog into a crate. Start it simple from the time you bring in the crate. Start by setting the crate and let her inspect it. Caves are natural habitats to dogs. From the word go, she will be interested and sniff around to inspect her new home. However, make sure you’ve laid the necessities. Crate pads. A doggie bed or a blanket. These are cues that will persuade her. Signal to her to get inside the crate. Ordering her with a firm but steady voice using commands like “Crate” or “Go to bed” or “Get inside”. Make sure to adopt one of the commands and use it consistently to avoid confusion. However, if she becomes stubborn or fails to understand the command, entice her with treats. Let her enjoy her first token, observe her reaction as she gets interested for more. With enough curiosity, toss some inside the crate. If she doesn’t follow the treats, physically place her inside the crate. In either case, don’t close the door before she completes the inspection and relaxes. You don’t want to associate the crate with bad experiences. That is why it’s important you make this the first exercise when you adopt her. Close the door and reward her. Once the inspection process ends and you have feeling like she is relaxed, shower her with praises. Something like rubbing your hand on her head or giving her a treat. Then, close the door. After a while inside the crate, let her out. Once you are happy with the outcome, let her out. Remember, you want to be gentle with her to create positive experiences that will make her enthusiastic about the new item she will own henceforth. To make sure she is cool with the crate, repeat and rinse. This time, try to use commands alone. Also, try to make it gentle yet firm. If she understands your commands, close the door and shower her with more praises. After a while, let her out. If something goes west or east, get back to square one. Or, use the puppy strategy coming next until she gets it right. Lastly, continue with the process until she gets used to the crate. Usually, this type of training doesn’t take that long. For the first day, it should take you at least 15 minutes to at most 30 minutes. For the case of puppies, which are most challenging, try using its dog food to lure her and aid her in overcoming her fears. Use these precise steps to help her. First, let her take her meal in front of the crate. Observe her reaction. If she is afraid, try to make it comfortable by praising her. For the next meal, place the bowl halfway inside the crate. If you did it right at the first stage, she should be comfortable. Then, for the final move, place the bowl with food inside the crate. I hope by now, she is dancing your tune. But here is the important point to note, make sure she goes inside alone without a push. Do this consistently in conjunction with the previous exercise until the crate and commands become a natural stimulus..
As you can see, this section can make a whole article or even a book. Admittedly, there are still some more questions to answer and discuss. But for now, we will close the discussion here. Till now, I believe you are beginning to appreciate the importance of having a crate when it comes to dog training. In the next point, we will shift our focus to specific types of challenges that dog owners encounter. One of it, it is when you own an extremely destructive dog or a dog with the problem of anxiety separation. To begin with, picture this. You’ve gone to work, and you’ve left this adorable creature locked in your apartment. Of course, you are a generous, caring, and loving pet parent. So, you’ve given it everything it needs: water, food, and toys to play. You're even considering buying a pet camera to monitor it. But what’s happens in the evening when you come back? It has pulled your beautiful couches apart, littered your elegant house, and messed up almost everything you adore. Even worse, it has broken out. I suppose this is not the ideal lifestyle you want with your dog - sort of street life. Or even gorilla strong dog crates. Any of the variation means the same thing. These types of crates will restrain a dog with destructive behavior or suffering from anxiety separation. To learn more about this type of crate, read this article on pitbull’s dog crate reviews (http://thepetly.com/dog-crate-for-pitbull/). It’s rather sad to say these behaviors will land you in trouble. This is because they are associated with aggression, and the consequences are dire if you do not exercise caution in time. Therefore, before things taste sour, take your dog to a behavioral training and socialization classes. And, don’t forget to ask for crate training lessons if you haven’t given it yet. However, if it is a matter of too much energy, channel it with regular exercises to suppress the vigor. Talking of regular exercises, how often do you go camping or cruising with your dog? In the next point, we will see how crates make it easy and safe to travel and camp. We are not all cut from the same cloth. Right? But, if you are like me, traveling and hiking is one of the MUST do activities with my Rex. However, it’s sometimes tricky to make him just sit at the back seat or at the trunk of my truck. The truth is, it’s not only risky but naïve. So, to avert the risks, I have a crate that he knows it’s time to travel or go hiking. With only that, I make sure my buddy is comfortable during the journey. It also gives me a revering feeling that he is safe. 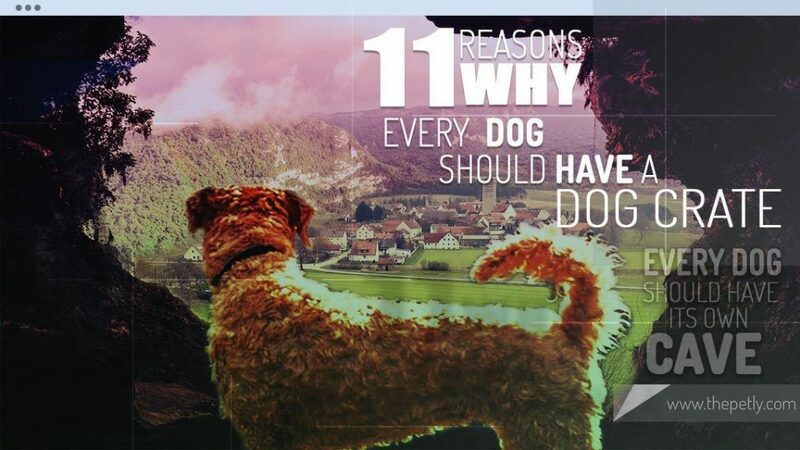 But before we go further on this topic, let's highlight common types of journeys you are likely to make with your dog. These are two common types of adventures you are likely to make with your pooch. In both cases, to be successful with your journey, you must have a crate. However, including camping, the type of crate you will need to make your trip successful, will differ. Also, there are other factors like the type and the discipline of the dog. Since this section will touch on another bigger topic coming on this series, I would rather discuss it in details in another article. For now, I will highlight the ideas here, and let you visit the article for further clarification. Let's start with various types of journeys that will influence the type of dog crate you’ll need. Common Types Of Dog Crates You Will Need Depending On The Mode Of Transport. When we consider the mode of transport, the crate that you are going to use to transport your dog by air is different from the one you will need by the road. Let’s discuss the differences of each in different sub-sections below. If you intend to travel by air with your dog, you will need a crate that is the International Air Transport Association (IATA) compliant. That means, the crate must conform to certain specifications like having a name tag, being open enough to allow air to flow inside with ease, and many more that I will cover on the article on the types of dog crates (Make sure you don't miss the article). For road transport, there are no specific specifications like those in air transport. Frankly, you can decide to use a crate or not. But before you even think about taking sides here, let me challenge you with this simple question. Why do cars have safety belts? Pretty obvious, but I won’t answer this immediately, I will reserve the answer for later. For now, let’s dig dipper into traveling by road by comparing public versus private means of transport. Travelling With Your Dog Using Public Means Of Transport. First, if you are the type of person who take subway or travel by bus more often, I challenge you to own those small breeds of dogs or some couch potatoes breeds that are not associated with aggression and still, are awesome with socialization. These dogs are easy to carry and take less spaces. For that reason, you won’t have much hustle with your dog. Take it from me, you don’t your dog barking or showing some aggression to some random strangers. Also, since not everyone enjoys dogs’ company, make sure in these public places you carry your dog with a good plastic dog crate or Soft-Sided dog crate. Travelling With Your Dog Using Private Means Of Transport. The good thing with private means, you don’t have to worry about the person sitting next to you. Also, the size of the dog is not an issue here. Unfortunately, this is the area with a significant problem. Most people take it casual when they travel with their dogs. To my amusement, they will tightly fasten their belts as tight as their car can enable them. But what about the adorable buddy (dog) they are carrying? It's left to enjoy the ride. Bang, there is the issue. But here is the thing, whether you are a farmer using your dusty truck to visit your farm or you cruise the country with your van or just a decent family with a luxurious SUV, don’t travel with your dog if you don’t have a suitable crate. Fortunately, there are crates built for road transport. They usually came with hooks or places you can strap them. Although there are different lingo to refer to them, one common phrase is crash tested crates. The bottom line, they will make traveling with your dog painless and safe. I can’t stress enough how this should be your first priority, especially if you travel a lot and also over long distances. For hikers and campers, there is always a possibility, after your travel, you will camp somewhere. When you go camping, treat your Fido the way you'll treat it back at home. The same way it is used to its home crate, let it have its tent unless it's one of those pocket-size breeds. 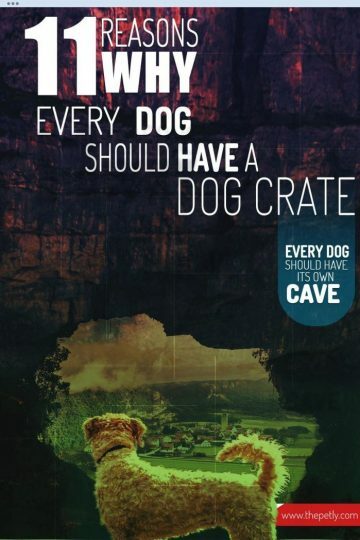 And if that is the case, don’t forget to bring along its home crate. For that reason, there is a different type of dog crate suitable for camping, known as dog tents. If you often hikes or camps, there is no reason as to why you should not own it. Till this point, you have precise reasons why you need a great traveling dog crate. I believe the question you might ask, why can’t you use your home crate for transport? In reality, except for air transport, there is no reason as to why you will not use it. But as they say, ‘a picture is worth a thousand words.’ Here are some animations simulating why it’s dangerous to use any type of crate especially with road transport. Use of a crash tested crate. So far, we’ve had an in-depth discussion of why you should buy a dog crate. We’ve been carefully crafting and sculpting each point to make sure the point sinks rock bottom. However, in this section, I will divert from the norm and quickly highlight some more reasons why a crate still matters. Think of this section as a bonus. A crate will act as a baby sitter – the truth is that we all have busy schedules. We need to meet deadlines and get things done in a certain way. As a result, squeezing our little available time to keep an eye to our dogs, may not come in effortlessly. So, a crate will help to contain your dog so as it doesn’t get you and itself in trouble. For that, you can relax and always do what you like doing feeling your dog is safe. For the sake of veterinary services – if you’ve been in and out of a veterinary hospital, I suppose you’ve noticed a crate is a must. Because of that, you don’t want your pooch to have its first experience with a crate in the hospital. This first-time experience, may stress it to the point of slowing its recovery. You don’t want that. Right? Visitors in your home – lets’ say someone or a group of people visit your home. You also don’t want to offend your visitors. So, a crate will be your best option to keep her locked, and away from mingling, as the crate will prevent the unwanted outcome. A crate is a relax-inn for her – dogs unlike humans, use their big chunk of the day either lazing, sleeping, or relaxing. A crate will offer a safe haven to keep-off unwanted interactions. As a result, it will allow her to enjoy her days quietly. A crate will keep her safe in the hotel during your adventures – for those dog-friendly hotels, having a crate will save you hustles you’ll get into if you didn’t bring a crate. Think about this point as emphasizing on point #3. But I’ve definitely steered away from the cons. Not that they are less important, but I simply didn’t want to derail this discussion. I also wanted to make my points clear. But if you need to get into more of the cons and pros type of discussion on the same topic, I highly recommend you read a similar article by the PetHelpful here. The discussion on the dog crates is far from the end. But on the brighter side, in this article, I’ve explained in details, if not all, reasons why every dog should own a crate. Along the way, we mentioned a few of the dog crates like crates ideal for traveling, camping, and suppressing certain behaviors. However, there are tons of crates for different uses we've not covered. Still, I’ve sprinkled a few terms here and there like heavy-duty, IATA compliance, plastic dog crate, Soft-Sided dog crate, and many more. All these phrases, ideas, and terms need dedicated articles to explain them in details. That’s why, as you sail with me in this series of dog crates, you will uncover the full meaning of these terminologies. You'll also have everything you need to know about dog crates in your fingertips. So, in the next section on the dog crates, we will cover top features you should be looking and MUST consider when selecting the best creates for your dog. 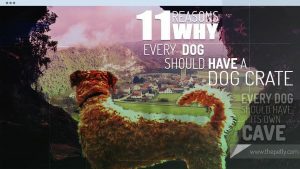 For now, make sure you understand these 11 reasons why dog crates matter as much as any tool that you’ll buy for your dog. Till next time, happy petting.